AFT Local 1904 is pleased to announce that we have reached agreement with the University on the implementation of a "Range Adjustment Program for Full-Time Librarians." For the complete text of the agreement, click here or go to the Contracts tab on the AFT Local 1904's website. The text of the agreement details: the criteria to be met, the eligibility requirements, the content of an application, and the review process. Most importantly, full-time Librarians who are eligible must apply by May 1, 2012. Join with AFT Local 1904 in congratulating the winners of the Montclair State University Outstanding Academic Advising Awards. Sponsored by the Center for Advising and Student Transitions (CAST), this program annually recognizes the outstanding work and excellence in the area of academic advising, advising administration, and faculty advising. As per the Constitution and By-Laws of AFT Local 1904, an Elections Committee has been properly constituted consisting of members who are not running for office with myself, David Trubatch, as chairperson. Also, eleven (11) delegates to the State Council must be elected. It should be noted that the President is automatically a delegate to the State Council and any Officer may also serve as a Council Delegate. Any full dues paying member wishing to have their name on the ballot for any of the above positions, including Council Delegate, are required to complete a Nominating Petition with ten (10) signatures of full-dues-paying members, which is then delivered to me, David Trubatch, via interoffice mail or directly in my mailbox in the office of the Department of Mathematical Sciences. Any nominations received before the April 4th General Union Meeting will be included on a sample ballot to be shown at that meeting. Additionally, at that April 4th meeting, nominations for office will be accepted from the floor. At the end of the April 4th General Union Meeting, nominations for officers and delegates will be officially closed. Note that only full members may nominate someone to run for an office. Members can nominate themselves with the required Nomination Petition. The nomination process at the April 4th meeting will be conducted by the Elections Committee. Following the nominations, the committee will read aloud the nominations and the positions for which they were nominated. If there are contested positions, the chair of the Elections Committee will place names for each contested position in a hat or box to draw for position on the ballot. Each candidate will be able to observe this if they or a designee are present. Then, the Council of New Jersey State College Locals will conduct the election by mail ballot. The Council will work under the supervision of the Elections Committee as to ballot design, name placement and mailing to dues-paying AFT members only. From the point where nominations are final, the Elections Committee shall have total supervision of the election process. A level and equal playing field will exist for all candidates and use of the Local’s membership list via labels and/or the Local’s email list with all election materials going through the committee and/or Council. If there are no contested positions on the ballot, the elections will be conducted electronically via ELVIS. The election will be conducted the week of April 9th and will be open for a minimum of 5 full working days. If there are any questions please direct them to me via email david.trubatch@montclair.edu. Unit members of AFT Local 1904 have been working without a contract since July 1, 2011. Want to show your dissatisfaction about the situation? 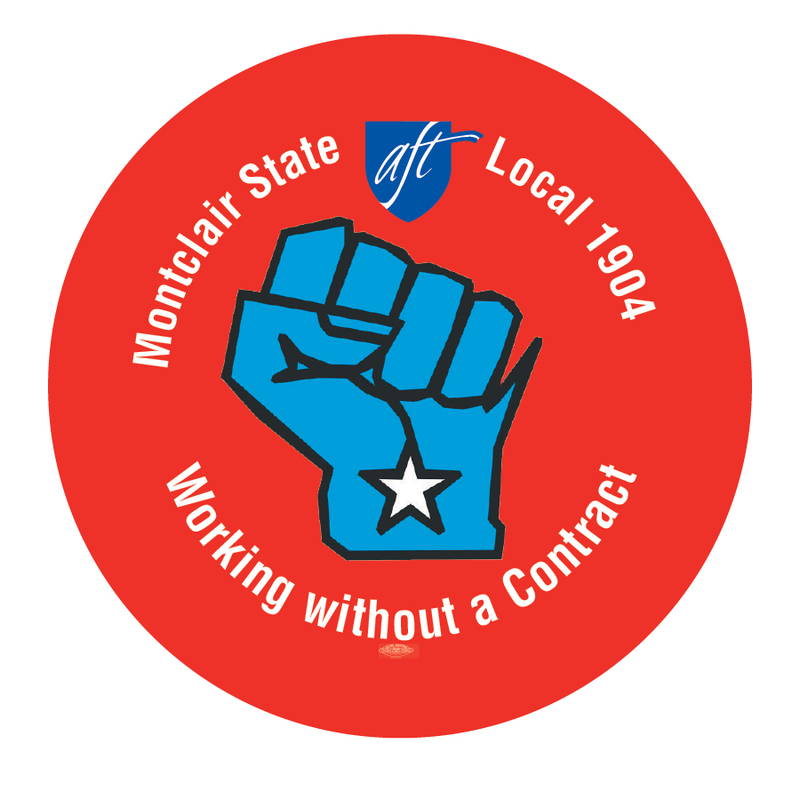 Get your "Working without a Contract" buttons from AFT Local 1904 and wear them on Wednesdays from now until the contract is settled. Call the Local's office to make arrangements to get a button at ext. 4453. Today the New Jersey Senate Budget and Appropriations Committee held a hearing on campus. AFT Local 1904 President Rich Wolfson testified on how the proposed reorganization of UMDNJ, University Hospital, Rutgers-Camden, and Rowan University will cost over $1.2 billion dollars, will not lead to one more building or program, and will only lead to huge tuition and fee increases that will be transferred onto the backs of the students. His entire testimony is here. When: Tuesday, March 13, 2012 from 9:00 a.m. to 4:30 p.m. This year the Senate Budget and Appropriations Committee is conducting a public hearing on the FY 2013 State Budget at Montclair State University. Rich Wolfson, President of AFT Local 1904, will be speaking on behalf of the Local. We expect other Locals in the Council of New Jersey State College Locals to also give testimony as well as representatives from AFTNJ and other labor organizations with representatives in Northern New Jersey. You also have the opportunity to participate if you would like the committee to hear your concerns and perspectives about the support the State of New Jersey provides to higher education, education in general or any topic of your choice relative to the budget. If you wish to register to speak call 609-847-3105 or click here. The morning session is closed. If you are attending, please stop by AFT Local 1904's hospitality suite in the Michelli Conference Room (UH 2160) on the 2nd Floor of University Hall. Refreshments will be provided throughout the day and you can view the hearing from there as well. We will also have buttons and AFT t-shirts available for participants to wear too. To RSVP for the hospitality suite check out our event page on Facebook.